How large is your comfort zone? Letting your comfort zone dictate your choices will stop you from living life to the fullest, because you’re limiting your new experiences. New experiences help us grow. If you stay in the middle of your comfort zone, it will shrink accordingly—your neighborhood, then your apartment, your bedroom, and finally your bed! 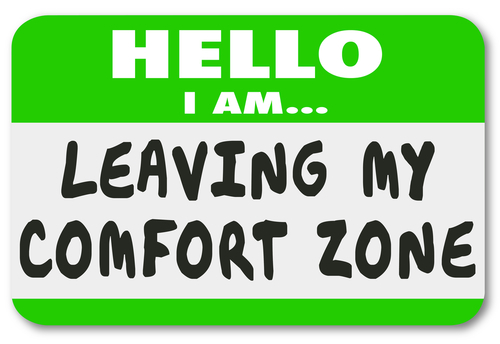 Wouldn’t it be better to expand your comfort zone?! Okay, you may say, but how do I do that? Warning: You’re not going to like the answer. You have to spend time outside your comfort zone. Start small and increase the time and distance you spend away from your comfort zone. If you’re not comfortable with public speaking, don’t schedule a speaking engagement for a group of 500 people. Start with taking a class, forcing yourself to speak up in meetings, joining a networking group that requires you to speak about your business every week. Do something that may feel like a giant step, but that, objectively speaking (pun intended), is actually on the small side. Isn’t this going to feel, well, uncomfortable? Yes, but over time it will feel less uncomfortable. And over enough time, it will eventually start to feel comfortable. Then you can take larger steps and further expand your comfort zone. In other words, to become comfortable speaking in public, you first have to be uncomfortable speaking in public. These are commonsense, relatively easy behavioral changes. The real work, the thing worth exploring in therapy is this: Where did you get the idea that life should always be comfortable, that you shouldn’t have to stretch yourself? And if you find yourself only thinking about making changes, instead of taking the actions, working with a therapist will open you up to a much more satisfying—and comfortable!—life. If you’d like to learn more, reach out to me here. I look forward to speaking with you. 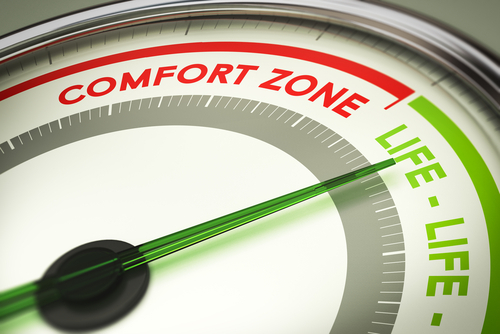 What are your thoughts about expanding your comfort zone? Leave a comment below.